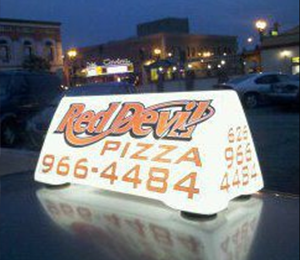 We make the best pizza and entrees around, made to order with fresh ingredients and your favorite toppings. 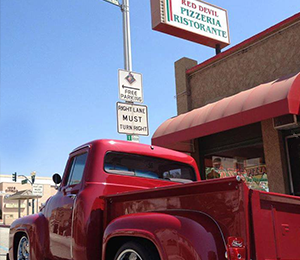 Whether you’re looking for an easy meal for your family or a feast for a special event, you can’t go wrong with Red Devil Pizza. Since 1966, we’ve been crafting authentic gourmet pizzas made to order, just the way you like them! Includes: Cheese Pepperoni, Ham, Bacon Bits, Mushrooms, Green Peppers And Onions. TOPPINGS: Pepperoni, Sausage, Ham, Ground Beef, Canadian Style Bacon, Pineapple, Mushrooms, Green Peppers, Onions, Olives, Jalapeno, Salami, Anchovies, Chicken, Garlic, Fresh Tomato, Bacon or Bacon Bits.